Although everyone seems to have heard of Blake’s visionary heads, some of these extraordinary images must be among the least known of his works. 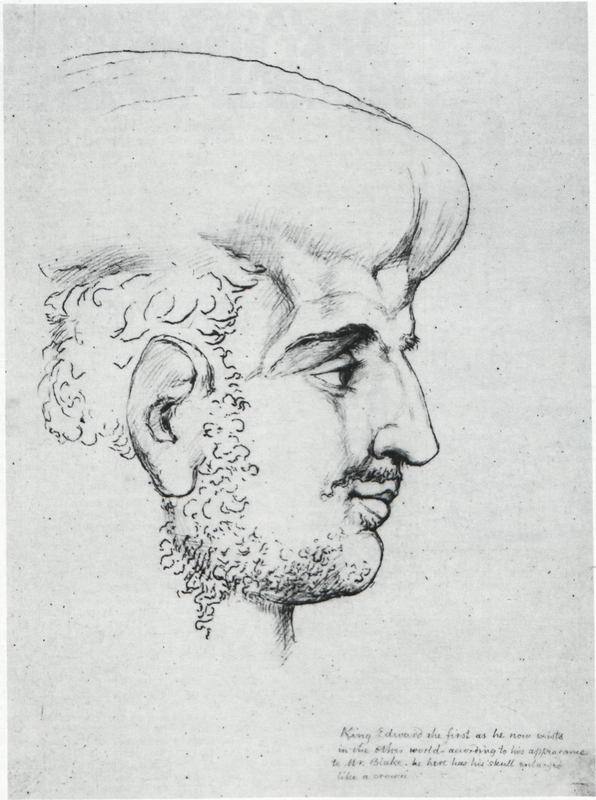 For example, the drawing catalogued by Rossetti as “38. Socrates. Vivid eye, talking mouth” (Gilchrist, 1880 ed., Vol. 2, p. 260) has not, so far as I know, been reproduced in any book or journal. Equally unfamiliar, I would guess, is “Rd. Coeur de Lion. Drawn from his Spectre. . . . at ¼ Past 12. Midnight”. 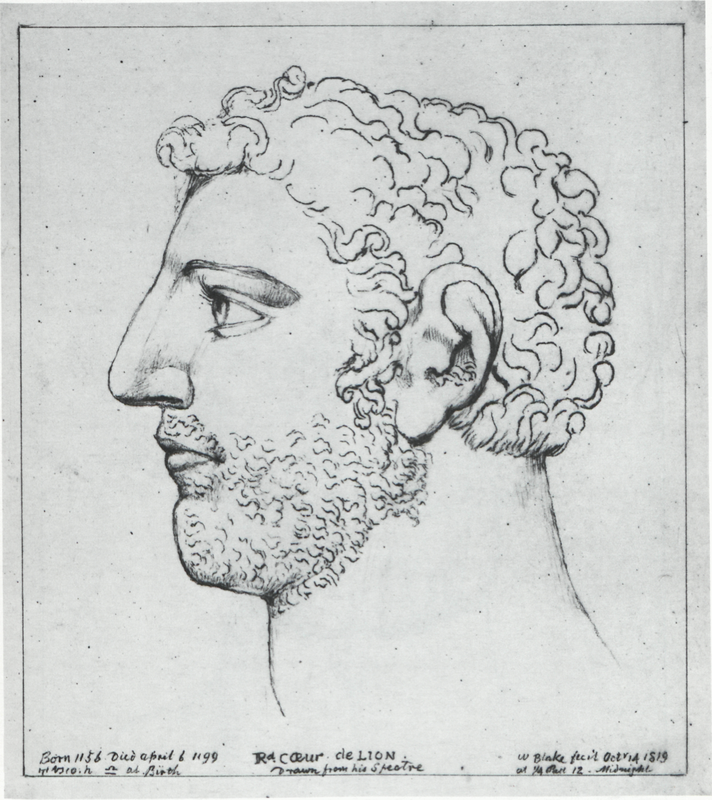 A reproduction of this head is to be found, I am told, in an early issue of Arts (Vol. 1, No. 3, Feb.- March 1921, opp. p. 57); but since neither the Bodleian nor the British Museum can supply a copy, one may assume that many students of Blake have never seen it. Even more inaccessible during the last forty years, however, has been the drawing described by Rossetti as: “Nebuchadnezzar. Vivid, and not wanting in truth to the Assyrian cast of countenance. Below the head is a ‘coin’ of Nebuchadnezzar, engraved in Varley’s ‘Zodiacal Physiognomy’.” (loc. cit., no. 36). Originally in the Linnell collection, this was sold, according to Sir Geoffrey Keynes (Bibliography, p. 318n. ), at Christie’s, 15 March 1918 (lot 163, Parsons, 42 gns.). In 1939 it was in the big Blake exhibition at Philadelphia (Cat. no. 209. Lent by the American Art Association—Anderson Galleries, Inc.). Since then it has disappeared. 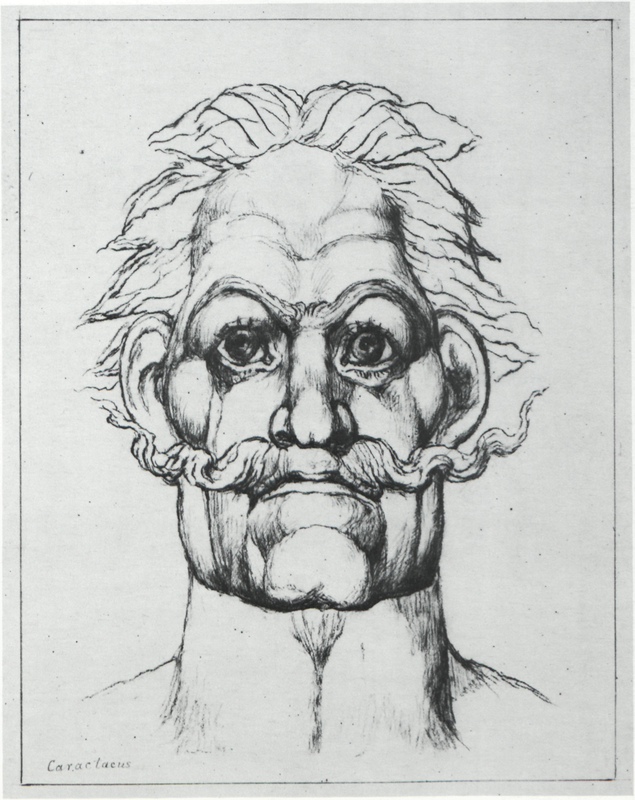 And although Linnell’s engraving of the reverse of the coin is in Varley, and a reproduction of his engraving of the crowned head (so reminiscent, incidentally, of Death in Blake’s Death on a Pale Horse) appears in Sir Geoffrey’s The Complete Portraiture of William and Catherine Blake (Trianon Press, 1977, pl. 21), no reproduction has been available of the drawing as such until the present time. The version shown here (illus. 1) is one of five tracings of visionary heads which I recently acquired from Mrs. S. M. Johns, a great-granddaughter of John Linnell. 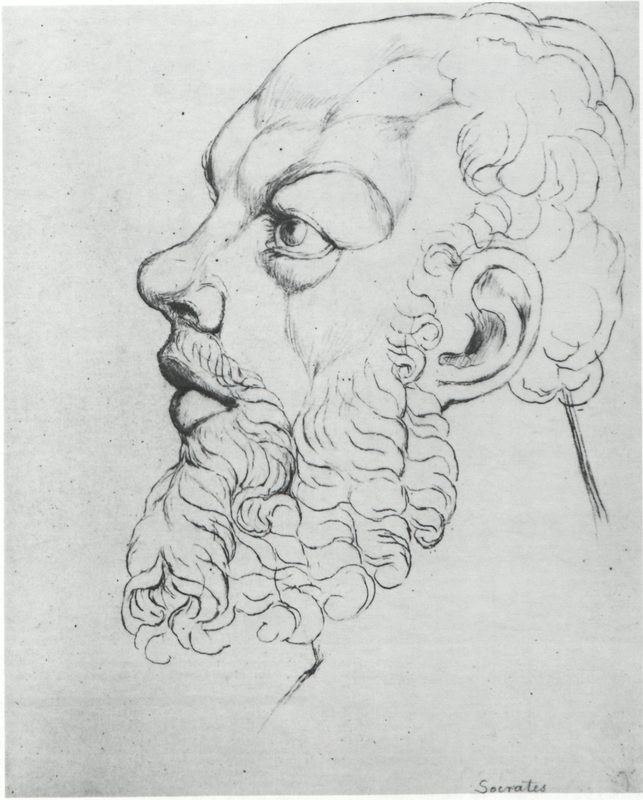 The group includes tracings of the aforementioned “Socrates” (illus. 2) and “Rd. Coeur de Lion” (illus. 3), together with the better-known “Caractacus” and “Edward the first as he now exists in the other world . . . ” (illus. 4 & 5). The inscription on the “Nebuchadnezzar” is particularly interesting. Both Keynes’s Bibliography (p. 318) and Bentley’s Blake Books (p. 626) give the impression that Blake’s drawing bears the words “Coin of Nebuchadnezzar seen by Mr Blake in a vision” (Keynes has “coin”, and a full stop after the final word). 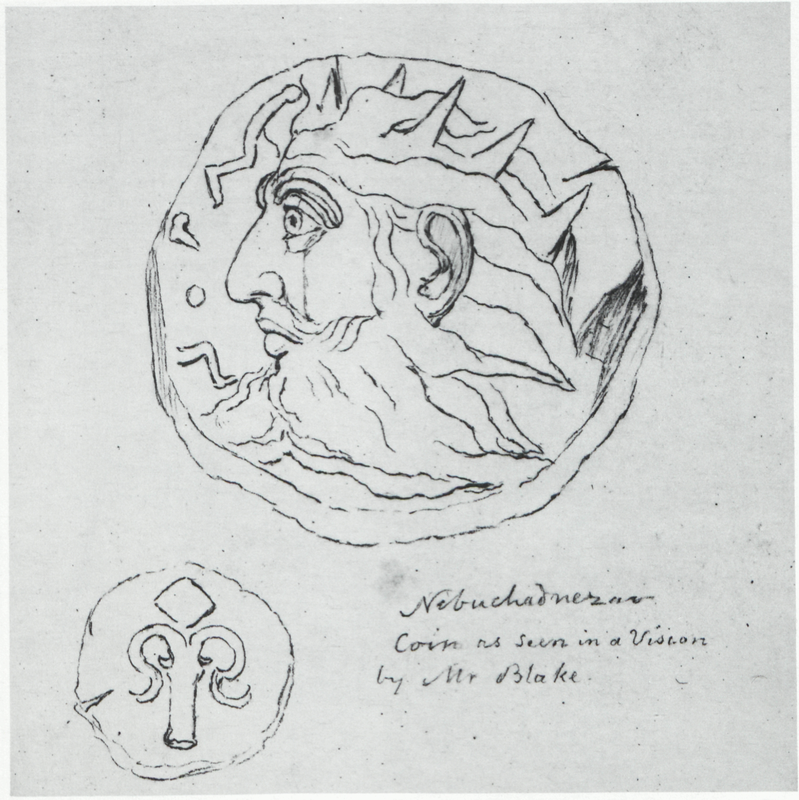 The Philadelphia catalogue, on the other hand, has “Nebuchadnazar [sic] Coin as Seen in a Vision by Mr. Blake.” On the tracing is written “Nebuchadnezar [sic] / Coin as seen in a Vision by Mr Blake”, which is almost identical with the Philadelphia rendering, and helps to explain why Rossetti’s description, quoted above, fails to make it absolutely clear that Blake drew two sides of a coin, not a coin beneath a head. Rossetti’s assertion that “Below the head is a ‘coin’ . . . ” is curiously misleading, and extremely difficult to account for if we accept that the original is inscribed “Coin of Nebuchadnezzar . . . ” as Keynes and Bentley suggest. But if we assume, as I think we must, that the most faithful transcript is the one to be found on the tracing—where the king’s name is not only the first word but also on a line by itself—it is easier to understand why Rossetti’s entry in Gilchrist reads as it does.